729 Princeton Place Gets Permits, Potentially Ending 3+ Years of Vacant and Blighted Conditions. | Park View, D.C.
729 Princeton Place Gets Permits, Potentially Ending 3+ Years of Vacant and Blighted Conditions. The days living with the vacant and blighted rowhouse at 729 Princeton Place appear to be coming to an end. With a new owner, a new design, and newly approved building permits, the property looks like a go for being completed and back in productive use soon. As nearby residents may recall, the issue dates to the Spring of 2015 when the then owner constructed a third story addition with no permits to do so (either filed or issued). Making the issue more complicated, construction began days prior to changes in the Zoning Law that would require the as-built addition to require a Special Acceptation and Board of Zoning Adjustment approval. 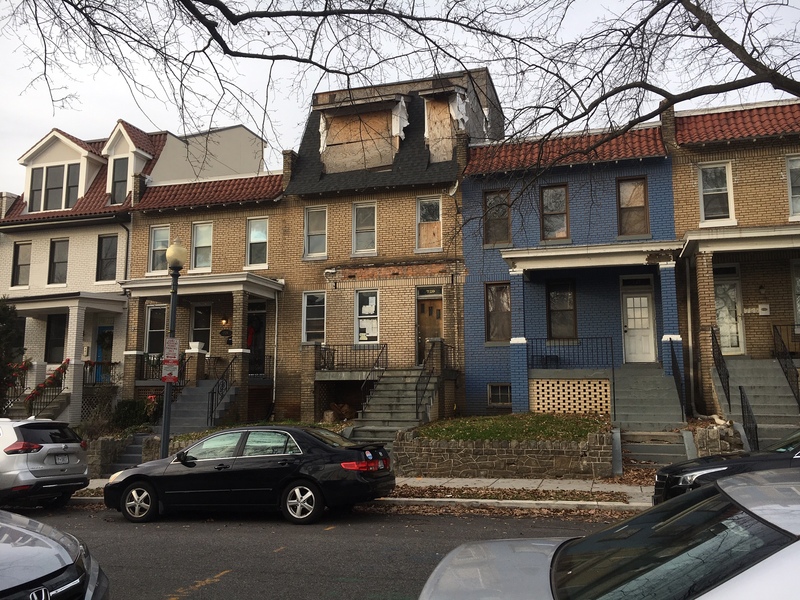 Rather than apply for the appropriate building permit or file a BZA case to seek approval, the owner repeatedly continued to work in violation of DCRA’s Stop Work Orders. Ultimately, this created an impasse leading to the current state the building is in today. 729 Princeton Place as of January 2019. Now it appears that the days of seeing this property vacant and blighted may be coming to an end. In June, 2018, the property was sold to a new owner. Unlike the previous owner, they have found a solution that will rebuild the third story in a way that is compliant with ZR-16 and will not require a BZA Special Exception (NOTE: the previous owner could have gone this route as well). 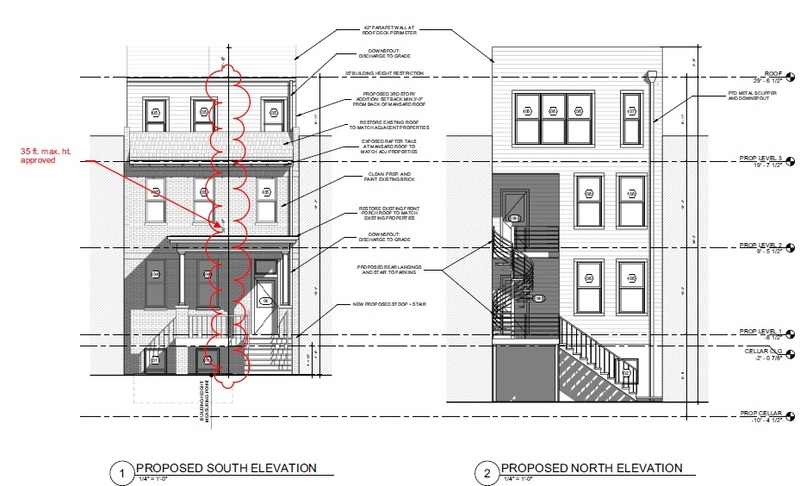 According to the plans shared with me and the language in the DCRA PIVS system, the new design conforms to the 35′ height allowed by right, restores a section of the original roof, and allows for the property to be converted into two living units. The third story as currently constructed is higher than the 35′ limit. Complete interior remodel to existing 3 story structure. Rebuild existing third story addition to comply with zoning and building code requirements. New rear 3 story addition. Conversion to a two-family flat. All new electrical, mechanical, and plumbing. Exterior work to also include landscaping + new parking pad off alley. … and here is the newly proposed plan for the building. Newly proposed elevations for 729 Princeton that comply with ZR-16. This entry was posted on January 2, 2019 at 9:32 am and is filed under Architecture, Development, Housing. You can subscribe via RSS 2.0 feed to this post's comments. It’s too bad that the revised plan is just a box grafted on to a house. At least the previous version made an attempt at integrating the 3rd story with the existing structure, unlike the current plan. Very unfortunate that it looks worse than it would have had it been completed ilegally.